Are you looking for a way to recognize your school’s most outstanding students? Do you wish to create a more positive school climate? Do you want to inspire academic success? Work with your principal to start a National Honor Society (NHS) chapter at your school today. With an NHS chapter, you will enable and empower your students to make an impact, not just for themselves, but for the community and the world. Watch and learn how NHS will make a difference for your students… and you! Adviser training through special tracks at 3 regional LEAD Conferences and State Summits for students and advisers. Sessions focus on leadership skill building and peer-to-peer networking. 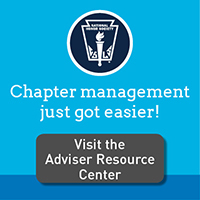 Online chapter management assistance and tools offered in our Adviser Resource Center, as well as support from expert national staff by phone and email. Idea exchange utilizing a National Student Project Database—fully accessible by members only—so you can get your next best idea for a service project or recognition ceremony. Digital and print publications, including our magazine Advise and Honor Society News, a monthly e-newsletter. An online store for purchase of official insignia, apparel, supplies, and member-discounted publications. Chapter recognition opportunities, including the Outstanding Service Project Award. It’s really very simple. Your school first needs to start a chapter. Visit our Start a Chapter page to learn more and get an application. You can also email membership@nhs.us or call (800) 253-7746, option 4.